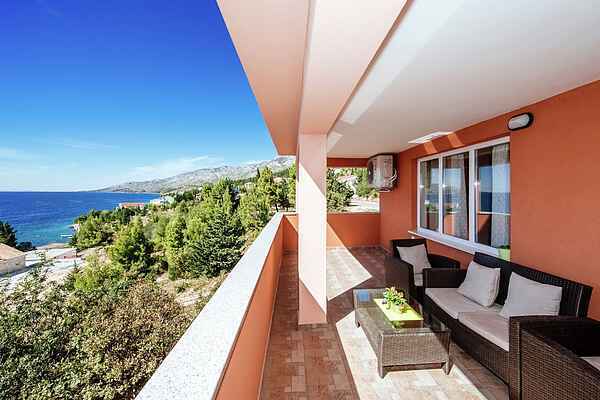 Apartment Karla is located in Starigrad Paklenica, the center of Paklenica Riviera which stretches some 20 km along the foot of the largest croatian mountain Velebit. There, the mountains join the sea and form a border between the Mediterranean and inland. Spacious and bright apartment is only 60 meters from pebbly beach. Positioned on the second floor it offers an extraordinary sea view from the beautiful balcony. Apartment Karla offers a large living/dining room, fully equipped open kitchen, 2 bedrooms and a modern bathroom. If using double sofa bed in the living room it can accomodate up to 6 people. You are welcome to use BBQ facilities in the shared garden. Within the distance of 500 meters you fill find various beaches, caffees, restaurants, grocery store and much more. Entrance to the most important climbing centre in Croatia, national park Paklenica is minutes away. Beside total rest and waterfront activities this region is a perfect for active vacation enthousiasts offering walking, cycling, diving, climbing, extreme sports. Ancient town of Zadar is only 45 km away. National parks Kornati islands, Krka waterfalls and Plitvice lakes can all be visited in 1 day trip.